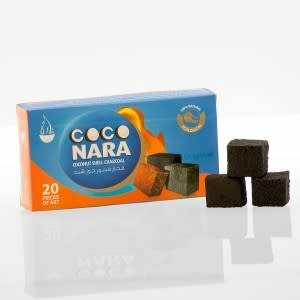 Coco Nara is 100% natural hookah charcoals and is made from compressed coconut shell. Tasteless and burn up to 60 minutes. Small box of 20 pieces. Coco Nara is 100% natural hookah charcoals and is made from compressed coconut shell. Tasteless and burn up to 60 minutes. You can light these coals on a stovetop or an electric coil burner. It takes around 5-8 minutes to completely light and glow red. Coco Nara has been ranked as the number one natural coals of choice for many hookah lovers. Specifications: 100% natural charcoal made from coconut shell , not quick lite coals , contains no Sulphur , burns up to 60 minutes , leaves less than 5% in ashes , clean burning & tasteless , does not produce any sparks while lighting or using , economical, not a single tree was cut to make this product, dimensions: 25mm x 25mm x 17mm. Safety instructions: Do not light charcoal with any petrol derivative, this is dangerous and can affect the smell of the charcoal, do not leave unattended in the presence of children , do not light in a confined space without adequate ventilation, does not produce any sparks when lighting or using economical and environmental friendly not a single tree was cut to make this product. Size: Small Box with 20 pieces.